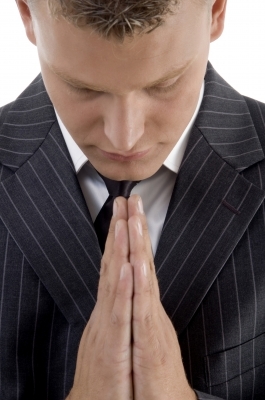 Prayer can be a controversial topic among Christians. Some treat it rather flippantly, while others, in my opinion, over-dramatize prayer. It seems that every Christian has a different perspective on prayer--how it should be performed, what it's meant to accomplish, and maybe more importantly, how it does or doesn't make a difference in your life. I think the key question that every Christian must ask himself is, "Do I believe that prayer makes a difference?" We all have doubts about prayer. That's what makes it difficult. If prayer were easy and immediately gratifying, everyone would be doing it all the time. But it's not; so everyone isn't. My intention in this post is not to tell you how to pray, or to discourage you in your current efforts. Rather, I want to pose questions to you. These are questions that linger in my mind when I think about prayer. Perhaps you've had the same questions, or perhaps these questions are new and will help you in fashioning your prayer life. Either way, I hope it's helpful. This may seem simplistic, but let's be honest. Do you pray? At all? Because it's expected at certain public events, or in certain social situations? Because you want things from God? Because all "good Christians" pray before every meal? Does how you pray influence whether you get an answer? Do you have to say the correct words in the correct order to get God's attention? Do you need to pray for a certain number of minutes each day in order to receive God's blessings? Is God concerned about the posture of your body when you pray? Do you need to constantly be talking when you pray? Or can you "let your heart do the talking?" I am often puzzled by what I should pray for. I don't really know how to fix everything or make things better. I don't know what to ask for! Sometimes God allows good things, and sometimes He allows bad things. Should I always pray for Him to remove bad things? If I do, am I wasting my time? What if He has another plan? If I'm asking for something good, maybe God knows that "good" thing will actually cause me heartache and trouble; so He doesn't give it to me. But I never get to hear the explanation. Should I even ask for it then? How Much Prayer Is "Enough?" Do you ever feel like the lack of your desired answer is God telling you that you're not praying enough? Or you're not praying properly? But wait, is prayer really about me? Or is it about God? Is prayer a "performance" that's being graded? Do I need to jump through all the right hoops and push all the right buttons to get God to listen to me?! Yes, I know I just wrote an entire post of questions with no answers. I would greatly appreciate if you would provide feedback to this post in the comments section. I will post my answers to these questions in the future and link to them on this post. "pray without ceasing" never let up, never loose faith, God is faithful.